South Korean stock markets were bullish Thursday on strong foreign buying, as the midterm elections results in the United States stoked investors’ appetite for risk. The benchmark index of top-tier market Kospi closed at 2,092.63 Thursday, up 0.7 percent from Wednesday. The second-tier Kosdaq was 1.7 percent higher. Market giants saw mild gains. On Kospi, Samsung Electronics inched up 0.1 percent, chipmaker SK hynix climbed 3 percent and biosimilar drugmaker Celltrion was 2.1 percent higher. Foreign investors had net purchased shares worth 489.9 billion won ($438.4 million) on Kospi and shares worth 22.8 billion won on Kosdaq. 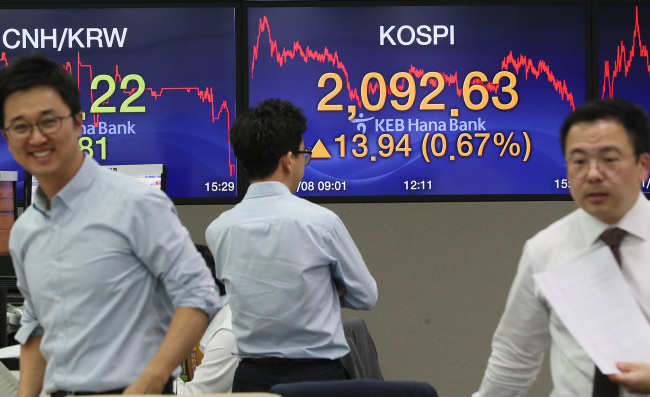 The trend overshadowed retail investors’ net sales of Kospi-listed stocks worth 274.3 billion won and domestic institutional investors’ net sales of Kosdaq-listed shares worth 96.4 billion won. Foreign investors showed net purchases of 283.6 billion won in the domestic futures market. The three-year state bond yield edged up 2 basis points from Wednesday’s close, while the 20-year bond yield inched fell 14 basis points. A bond yield moves inversely with the bond price.### The local currency strengthened against the greenback by 6 won and was trading at 1,117.3 won per dollar at Thursday’s close. The stock upshot came in line with gains on Wall Street on Wednesday. The broad-based S&P 500 gained 2.1 percent, the tech-heavy Nasdaq surged 2.6 percent and the Dow Jones industrial average climbed 2.1 percent. Also on Wednesday, the midterm vote yielded a split US Congress where the ruling Republican Party lost control of the House of Representatives while strengthening its majority in the US Senate. The elections results triggered investor appetite for risky assets across the globe and raised expectations for a medium-term rally in Korean markets, Seo Sang-young, an analyst at Kiwoom Securities, told The Korea Herald. “In case of the Republicans’ sweeping victory, the Korean stock market would have seen a big slump,” Seo said, adding the result signals the US’ “slowdown in ramping up global trade conflict” until a potential US-China summit during a forthcoming Group of 20 meeting at the end of the month. Korea’s equity market has experienced volatility since October, as signs of heightening US-China trade conflict have prompted foreign capital flight. Foreign investors net sold shares worth a combined 4.6 trillion won on Kospi and Kosdaq in October, contributing to the Kospi’s 22-month low. The relief rally of stocks and the local currency started this month following US President Donald Trump’s hint at a summit with China’s President Xi Jinping.